GALT doesn't get greyhound puppies very often, but when we do, there's always a lot of interest! 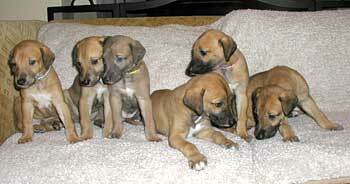 Puppies are generally available for adoption at 3 months, health permitting. Greyhound puppies are nothing like retired racing greyhounds. I have had 3 retired racers and 3 greyhound puppies over the last 18 years. I had the wonderful opportunity to adopt my current two puppies from the Greyhound Adoption League of Texas (GALT). This is the best greyhound adoption organization that I have had the pleasure of working with. They do amazing things for greyhounds and are a remarkable group of people. Puppies need constant attention and supervision. You also need to continually puppy-proof your house. As the puppy grows and gets taller they can reach new heights (literally). You will want to limit the area in which the puppy has access to. This helps keep track of what they are doing and helps them feel secure. Baby gates are great for blocking hallways, stairs and other rooms. We use baby gates to keep the puppies in our living room where we spend most of our time. This way we can see them at all times and be able to correct any bad behavior (like chewing on furniture) as it happens. The puppies might need to learn how to walk up and down stairs. If you have another greyhound or dog to help them learn from it actually happens really quickly since the puppy always wants to go where the big dogs go. If it's just you and your puppy, just take it slowly and remember start with going up first - it's a lot less scary than going down. You need to always put things out of reach and in closets out of sight (examples: shoes, pens, paper, food, computer cords, etc). Some things can't be put up, like coffee tables, furniture and window ledges. 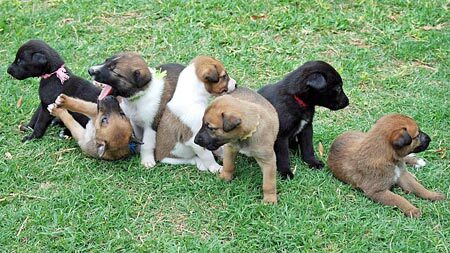 You will need to be diligent about watching the puppies and correcting their behavior. Anything the puppy can get their teeth on they will chew and eat. It does not matter if it has a smell or not and it also does not matter if they have never seemed interested in it before - they will at some point. The term land shark is not an exaggeration, they chew everything - it's one way they explore this brave new world. Our two puppies enjoy chewing on tennis balls, stuffed toys, rawhides, and kongs. Supervision is always necessary when puppies are chewing and teething. They will rip open and eat the stuffing inside stuffed toys, eat pieces of anything they chew on that they can get off, and eat anything they can get their mouths on. Puppies have incredible amounts of energy. They need to get lots of exercise. A tired puppy is a good puppy. Puppy greyhounds are also extremely fast. They will need a fenced in area to run. Never let any greyhound off leash unless they are in a secure fenced in area. This is the number one rule of all. Just because they did not go through race training does not mean they do not have a prey drive or the speed to run. They are amazing litle speed demons when they run. The puppy will also need to be leash trained. A martingale collar is needed to help keep your puppy greyhound secure and to not be able to wiggle out of their collar. Everything is new to a puppy. They are very curious about everything. They need your guidance and help so they do not get hurt. I have a spray bottle filled with water that is used when the puppies do something they are not supposed to (like chew on furniture). This is a great help in training your puppy. After spraying the puppies with water a couple of times, now when I pick up the bottle the puppies stop what they are doing. Using a crate when not at home helps keep your home and puppy safe. I give our puppies a kong filled with puppy food, puppy treats, and topped off with some peanut butter. When I leave I just say "kennel" and the two puppies run into their kennels, lay down and wait for their treat. This takes the focus off of me leaving and gives them a treat to work on while you are away. It helps reduce separation anxiety. Since adopting two puppies over 9 months ago I only get 5-6 hours average of sleep per night even on weekends. Puppies do not know time or days of the week. They do eventually nap occasionally, but dont' count on it. It is comparable to having a newborn. If you need a lot of sleep, I would not recommend a puppy. Puppies have very small bladders. They need to go outside a lot during potty training. I highly recommend keeping a "potty journal". It really helped me keep track of when the puppies last went out to potty and be able to determine when they would need to go out again. It is very important that you try to get the puppy used to going outside and not have too many accidents so they understand where they need to go potty. Always take the same route when you take the puppy outside to go potty - this helps them know where to go. A routine helps in potty training your puppy. Watch for signs from your puppy - they will get used to the routine very quickly and give you a sign right before they start to potty. To give you an example, our puppies had to potty 18 times per day when we got them home. They also need to go out to potty in the middle of the night. They cannot hold it through the night until they get older. Be prepared to make a potty trip once or twice a night between 1-3am. It is also very critical not to scold the puppy when potty training - instead reward them and praise them when they potty outside. I give the puppies a little treat when they pee and poop outside. This makes them want to repeat this behavior. The majority of the accidents will be human error - I would forget that it had been a while since they were outside and was reminded by the sound of pee on the floor. Be prepared to clean up accidents - they will happen. There are essential times when puppies need to potty - when they wake up, about 20-30 minutes after they eat or drink, and after they play. Two books that have some helpful tips are Puppies for Dummies and Puppy Raising & Training Diary for Dummies. Expect cute little devils that will tear everything apart, chew everything up, eat items they should not, have potty accidents and have more energy than ever thought possible. Then and only then will you be prepared and possibly ready for a greyhound puppy. They are truly a handful and then some. Puppy obedience classes can help with bonding, training, and meeting others with puppies. Having puppy play get-togethers could help in tiring out your puppy. I will always say that there is nothing like a greyhound puppy. Our two puppies have the pleasure of growing up with two retired racers. All four of our boys get along very well and I am hoping that the puppies will hopefully learn to nap more from the older boys. My two puppies are my babies and I would not trade them for anything in the world. There have been some rough times, late nights, early mornings and trying times, but it is really worth it if you have the time, energy and patience. I cherish every minute I share with my puppies. And yes, they do grow way too fast. If you adopt a greyhound puppy please take lots of pictures and laugh instead of cry. Puppies grow so fast and they will be full grown in the blink of an eye. GALT is a wonderful organization and those that adopt a puppy can be put in touch with those of us that have greyhound puppies too. The best support comes from those who have gone through it and can share experiences. Best wishes and good luck.